I originally felt like I had drawn the short straw when assigned this album. The two singles from the album, “Country Boy” and “Rhinestone Cowboy” are my two least favorite Glen Campbell singles, and this album is almost relentlessly downbeat in its feel and lyrics. Al DeLory was often criticized for overproducing Campbell’s albums with string arrangements, but his arrangements never drowned out Campbell’s voice. At points that comes close to happening on this album, which was produced by Dennis Lambert and Brian Potter. The album opens with “Country Boy”, written by Dennis Lambert and Brian Potter, a #3 country single that also charted pop. To me the production sounds far more over the top than DeLory ever was guilty of producing. As far as being country music, it is at best ersatz country. Lambert & Potter also provided the next three songs on the album, “Come Back”, “Count On Me”, and “Miss You Tonight”, all passable album filler material salvaged by Campbell’s vocal prowess. While I don’t think these songs would stand alone as singles, they further the general theme of the album, which I would describe as that of the alienation of a country boy lost in the big city. Side one of the vinyl original version of the album closes with the Smokey Robinson penned Temptations classic “My Girl”. While I wouldn’t describe Campbell as a blue-eyed soul singer, he always does a passable job on soul and R&B material. Side one of the album was mostly downbeat material so it was nice to have side one end on an upbeat note. Side two opens with Larry Weiss’s “Rhinestone Cowboy”. This song was Glen’s biggest single, selling over two million copies on initial release and would receive two Grammy nominations for best pop vocalist and song of the year, and would win ACM Single of the Year for 1975. “Rhinestone Cowboy continues the general theme of the album. Next up is a nice cover of a Mike Settle song “Build You A Bridge” followed up by a Johnny Cunningham song, “Pencils For Sale”. The album closes out with the Barry Mann/ Cynthia Weil composition “We’re Over”. As far as I know this song was never a big hit for anyone, but it is a well crafted song that I can see any number of contemporary artists (Adele, Michael Buble`) handing well. I had not listened to this album for many years as it strikes me as basically a seventies pop album, which I found to sound entirely different than the classic Al DeLory produced albums I had come to love and cherish. Horns – Paul Hubinon, Chuck Findley, Don Menza, Jerome Richardson, Tom Scott, George Bohanon, Lew McCreary, Dalton Smith / Strings – Sid Sharp and the Boogie Symphony / Backing vocals – Ginger Baker, Julia Tillman, Maxine Willard. I would give this a C+ but many of my non-country music loving friends consider this to be their favorite Glen Campbell album, and considered as 70s pop this album is probably a B+. While 2011 was a bland and boring year for mainstream country music where anthems to dirt roads, tales about being someone’s honey bee, and odes to plastic party accessories were all over the radio, it did feature some bright spots. There was even one artist I thought was so constantly strong, two of their singles made my top ten for the year. I would’ve added this person’s latest as a third, but two in one top ten is more than enough. So in addition to complaining about those songs that seem to have taken country music off track, let’s take a moment and celebrate what was good about country music in 2011. And judging by my list, you have to remember that just because a song spent four or five weeks at #1, doesn’t mean it’s of good quality. So here’s my list of favorite songs, all released as singles in 2011. I’ll have the rest of my list, numbers 11-45, on my own blog later this month. The balance between religion and spirituality in American popular culture is often shaky – there are those who believe in the teachings derived from texts and others who choose to let a higher power guide them, but don’t necessarily tie it to a particular faith. As there are those who happily merge the two. Very rarely does a singer emerge from the shadows to clearly leave their mark by just a song, but Houser has here. Not only is he among the greatest living of all country singers, but also he may be the best trying to have chart success today. “Time” is nothing short of a masterpiece, a classic and iconic statement from a living profit. Problem is, Houser occupies his time with distracting southern rock – a decision marking his downfall. If he only understood that he was put here to create songs like this, he would sour into the heavens, and fill the shoes of the ilk in his wake. Alright, I love Radiohead. I admit it. I bought In Rainbows, and it struck me as a phenomenal record. Imagine my joy when my favorite track off the album was going to be performed at the Grammys! My only complaint was that Thom (the singer) moves weirder than Chris Martin. But for everything else, the performance was golden. I was skeptical at first, but the marching band was an amazing touch — a stroke of genius, in my opinion. Very different than the original (listen here) which has electronic beats instead. This is just a very cool song, and a great performance. Two of my favorite vocalists singing two of my favorite songs. What could be better?! Well, I would have preferred more singing together, but the perfect performances from the two definitely validate their Grammy wins. They are both wonderful ladies, and Kristian Bush is nice, too. 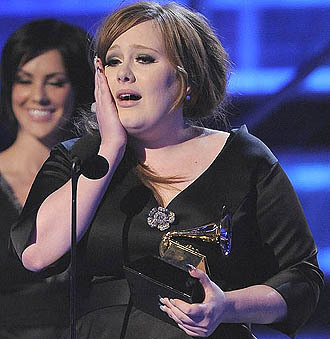 Even sweeter is how Adele beat the Jonas Brothers. YES!!! Just the fact that she could go out there after all that she’s been through and sing that well…? She is a very resilient person. This performance cements the fact that she deserves to be here, and she seems to be doing as well as she can after all that. I still kind of wish she would have done “Spotlight“, but whatever. “You Pulled Me Through” was great, too — it matched the mood much better anyway. I’m also sad about the whole Chris Brown/Rihanna thing. I hope she’s doing okay. So what do you guys think? Agree? Disagree? Well, the other three competitors in the category are three of my favorite artists, who I have discovered through iTunes free singles, namely Duffy, Adele and Jazmine Sullivan. I got all of their respective free singles over the course of 2008, and then followed them to get their debut albums throughout the year, and I love all three of them. Adele and Duffy are both considered neo-soul singers, compared to Amy Winehouse, while they have no resemblance to her in any way. Adele is a singer-songwriter with a blusey voice who comes from England, while Duffy sounds like she traveled through time straight from the 60’s, while she really came from Wales. Jazmine Sullivan sings R&B and hails from Philadelphia- tutored by Missy Elliott and she has had much success in the U.S.
About their songs, Duffy has her international hit “Mercy” (Nominated for the Grammy for Best Female Pop Performance), Adele has the hit “Chasing Pavements (Nominated for 3 Grammys including Record and Song of the year) and Jazmine has her R&B #1 “Need U Bad” (And is nominated for various R&B awards).